Saturday 30th June was a day of great joy and celebration for the Jesuits in Britain. 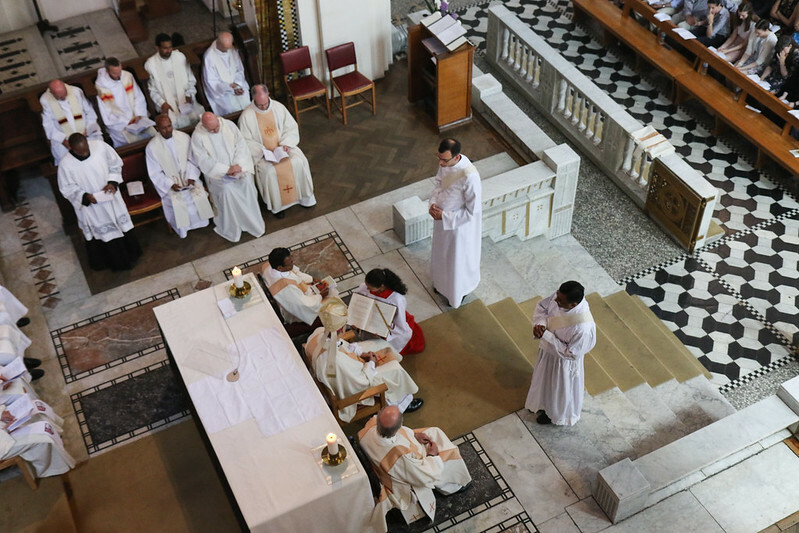 Bishop Nicholas Hudson ordained two British Jesuits - Kensy Joseph SJ and Philip Harrison SJ - at St Ignatius Church Stamford Hill before a large congregation of friends, family and parishioners, and alongside over fifty concelebrating priests. There were smiles everywhere as well as a few tears of joy, gratitude, and possibly relief. In the congregation were colleagues from Jesuit Missions and Jesuit Refugee service where Kensy and Philip have served during their formation, as well as fellow students, and all the current novices and scholastics. Many had travelled long distances to be there, in particular members of Kensy’s family who had come from India. Kensy and Philip joined the novitiate in Birmingham together in 2007 and were ordained deacons last year. The theme of the Liturgy, through scripture chosen by Kensy and Philip, was the good shepherd. Bishop Hudson reflected on this theme, reminding all present of Pope Francis’ call to priests the have the courage to walk with those who walk away from the church, to go and fetch the lost sheep. He observed that the priests who are best remembered are not necessarily the most able but the ones who take most interest in the lives of their flock: “what matters is not so much what we achieve as what’s in our heartl”, he told Kensy and Philip. Bishop Hudson reflected on the need for humility in priestly ministry, referring to Cardinal Hume’s advice to young priests – that criticism is a chance to thank God for humility. Perhaps the most moving part of the ceremony was when, after the anointing and the laying on of hands by the Bishop, all the concelebrating priests were invited to come forward and lay hands on the new ordinands. “The most ancient gesture associated with the liturgy of ordination is the laying on of hands. Through it the Bishop connects us with all the priests and Bishops who have come before us marked by the same faith. That was a truly special moment for me,” Philip reflected afterwards. Another lovely moment was the vesting, when two people close to the ordinand help him don his priestly vestments – the stole and cotter. Along with family members two Jesuits who were contemporaries of Philip and Kensy at the noviciate, Wouter Blesgraaf SJ and Eddie Cosgrove SJ helped with the vesting. Both Eddie and Wouter were ordained last year. “It’s great to celebrate something so important in our lives and the life of the Church” Eddie commented. “There was a tremendous sense of the loving support of friends, family and people who have known us for many years for which we are both very grateful,” commented Kensy, who gave the vote of thanks at the end of the service. The mass was beautifully sung by three choirs. The St Ignatius Choir and the Caribbean Choir welcomed the Choir from the Most Holy Trinity in Southwark, where Philip has been serving as deacon for the last six months. After mass many people queued to receive a blessing from the new priests. Philip was born in Bristol. He studied English at Leeds University before working as a full -time volunteer with homeless people and people with learning disabilities, as a member of the Jesuit Volunteer Community. He joined the novitiate in 2007. He studied Philosophy at Heythrop College before training as a secondary school teacher in Edinburgh. He took his Theology degree in Columbia, where he also did pastoral work. Since his diaconate ordination last November he has been serving as deacon in an East London parish and working with Jesuit Refugee Service. Philip’s next mission will be to study at the Biblicum in Rome.